Reporter Brian Milligan who works for the UK government broadcasting corporation, the BBC, has written an article to explain why he thinks EVs cost more to run that petrol vehicles. Despite the fact that in the UK EV owners receive a £5,000 subsidy, free road tax, free London congestion charge, free parking in many London boroughs and an EV's energy costs 1/10th as much per mile compared to a petrol car, Mr Milligan has managed to manipulate the figures enough to come up with a petrol powered Fiat 500 being cheaper to own over 3 years than a electric Mitsubishi MiEV. The calculation 'trick' used is vehicle depreciation costs, which sounds very familiar. You may recall UK based Glass's Guide released a statement in June saying all EVs would be effectively worthless within 5 years. Glass's are so well informed they based their expert opinion on an absurd projection that replacement battery costs will rise 33% by 2018. 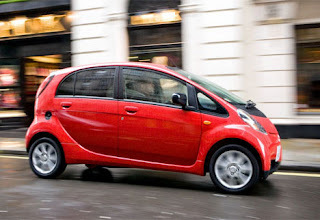 The BBC are reporting "Mitsubishi already admits that its electric i-miev will depreciate by nearly £15,000 in its first three years." The BBC don't quote a source or attach a name to this other than Jason King, who evaluates second-hand values for the aforementioned Glass's Guide, and we are unable to locate any Mitsubishi press release that makes this statement. However it should be noted that the Fiat 500 used in the BBC comparison also depreciates 50% over 3 years. Glass's themselves say most ICE powered cars retains only 25% of their value after 5 years! This is a classic journalist trick of distorting the way information is presented. We already know the whole premise of the article is anti-EV starting from the title down. For example, the BBC writer quotes the Association of British Insurers (ABI) saying the relative risks for EVs have not been worked out yet, but the writer leads with the assumption that insurance costs could also end up being higher for electric cars than for petrol cars. That is simply based on the negative opinion of the writer, not facts. What we think Mr Milligan has done is take a Mitsubishi statement saying depreciation of the MiEV is comparable to a regular ICE car at 50% over 3 years. To heavily bias the argument in favor of petrol cars he then picked the cheapest new car on the market for price comparison, the Fiat 500 with a purchase price being 1/3rd that of the MiEV, before calculating 50% depreciation in pounds for each vehicle then adding that figure to total running costs. The BBC writer further skewed the results by calculating depreciation on the full sales price of the MiEV before subtracting the £5k incentive and not after which is another bit of convenient mathematics. In fact, if the incentive is subtracted before calculating depreciation Brian Milligan wouldn't have anything to write about because the cost of owning the MiEV over 3 years then becomes £1,557 or 16% CHEAPER than the Fiat 500. If we eliminate the imaginary £300 service charges (what do you service on an EV, washer fluid?) the savings with an EV start to stack up rapidly. Due to the extremely cheap energy costs of an EV combined with zero maintenance, the savings clock up with every mile driven. The longer an owner keeps an EV the more they save. Perhaps this is the reason why Mr Milligan hasn't picked a 5 year time frame for his futile argument. The concept that demand for new EVs is and will remain ahead of supply for several years, while the auto industry builds production capacity, never seems to enter the writers mind. The laws of supply and demand (which they are obviously a bit vague on at the public service run BBC) should ensure a positive effect on used EVs values for the foreseeable future. The fact is that EVs are 90% cheaper per mile to run than any petrol ICE powered car. The only way an ICE car can be cheaper to own than an EV is if it's never actually driven anywhere. Once electric vehicles enter the community and word of mouth spreads, manufactures will be flat out to meet demand. This will be especially so in the UK where the government continues to raise fuel duty and petrol prices are setting record highs of £1.20 a liter (US$7.00 per US Gallon). Anyone familiar with media knows that if someone wants to make a point they give press releases to various papers and other news outlets. We have seen a great deal of recent anti EV press. I expect to see it continue right up to the release of the Miev, Leaf and the Volt this fall. We can take the amount of poison pen articles as a measure of how significant the threat of EV awareness not to speak of popularity is viewed by powers that be. I wonder where he received the notes to write the article. We might presume he researched the material himself. I doubt it. Hmmmm...if EV's do depreciate by this much...will this mean that a forecast is projected that they will be cheaper to manufacture in the future..No gearbox necessary...no emission systems..less mechanical components...more package-able...hmmm lets think...seems to have easier manageability for mass production....part of the solution for the GFC? Positive engineering works have positive affects on the people of the world! Brian Milligan as a reporter, would have to interview Carlos Ghosn, Norbert Heithofer, Takashi Nishioka and Elon Musk to illustrate himself about the electric car. It would be a nice way to get true information and calculations about this market. This indeed would be a very interesting article to read. Unfounded conjectures do not add anything to the market or to readers and not passes of desinformation and unknowledgement. Do the CEOs and presidents of Renault / Nissan, BMW, Mitsubishi and Tesla haven't yet made such accounts? The only situation such dramatic depreciation could occur would be a significant drop in the cost of battery manufacturing (not rise, as the author stipulates). This is indeed likely to happen, just like it happens with newly introduced electronic products. But I wouldn't call it depreciation. It affects both used and new products and should rather be seen as an "new gadget" fee. BTW. EV's don't require gearboxes but it doesn't mean they wouldn't benefit from having one. Constant torque is good (much better than what ICE's can offer) but not as good as constant power.